Jeff Harvey grew up in northern California doing nothing but making art. Since then he has graduated from BYU in illustration and moved to Utah where he lives with his wife and family, still doing nothing but making art. Quiet as a Church Mouse is a story that comes straight from the childhood of author Stephen Bevan, who used to have trouble sitting reverently in church as a little boy. He wrote this book to help other youngsters like him use their imaginations to help them be more reverent. He thanks his dear mother for teaching him about the "church mouse." The book is a really cute idea. It is written very simply, with very few written words. Most of the story is told through the adorable and impressive illustrations. I admit when I read the book to my children, I was left wanting more. 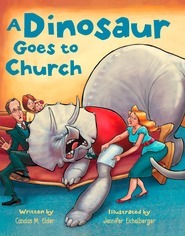 There was no depth to the child's realization of what the church mouse must actually be. The non-spiritual parts of the book were fine being simple and vague, but I felt opportunities were missed in the spiritual realizations. My 12-year-old felt the same as I did, but my little boys (5 and 7), did enjoy the book and wanted me to read it again immediately after. I suppose their opinions matter a lot more than those of older people, considering the book was written for children around their ages. So, though I felt the book was too simple, it was just right for my little boys. And that's what matters.